A recent report here in Ireland revealed that in over 55% of pregnant women giving birth last year at one of the primary maternity hospitals in the country were overweight (43%) or clinically obese (13%). Hot on the heels of these shocking statistics we are looking at the correlation of public health and tranport, something that the United States in only getting to grips with in recent years. In the United States of Obesity, transportation is a public health issue. As profiled in the recently released report from the Trust for America's Health, "F as in Fat", obesity rates continue to rise across the US, increasing the risk of serious health problems like diabetes and hypertension. To solve the obesity epidemic, the data suggest, Americans need to rethink their dependence on the automobile. "F as in Fat" breaks out obesity numbers state by state. According to streetsblog, it appears that transit and pedestrian-friendly states are doing better than the national average. To get more precise, streetsblog decided to compare adult obesity rates, as gathered in the report, to commuting statistics in the U.S. Census. The result is the scatterplot shown above, which clearly shows that states where more people drive to work have higher obesity rates. That said, while a large shift away from driving can make a big difference, it can't solve the obesity crisis on its own. 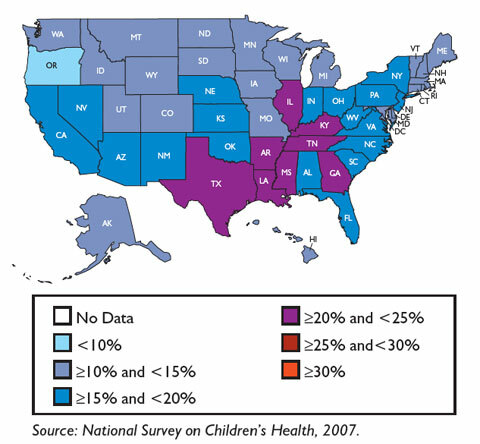 Percentage of Children aged 10 - 17 classified as obese (2007). Although "F as in Fat" doesn't analyze transportation behavior itself, the authors agree that moving away from a reliance on the automobile is a critical component in curbing obesity. Their recommendations include: passing legislation supporting non-motorized transportation, such as an expansion of the Safe Routes to School program or a national complete streets bill; building more safe pedestrian space and bike paths to encourage active transport; and supporting mixed-use, walkable, and transit-oriented development. 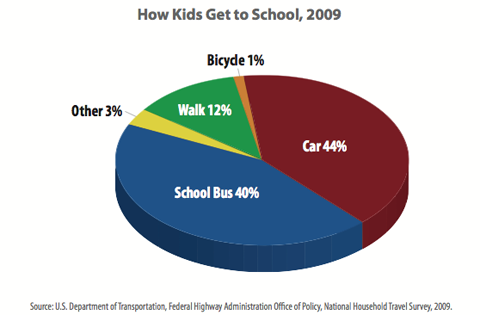 We need to get kids to cycle to school. Below is a great short video from Streetfilms documenting NYC's first Bike-to-School Celebration. The rides had "pick up" spots along the way where more students joined the biking pool. 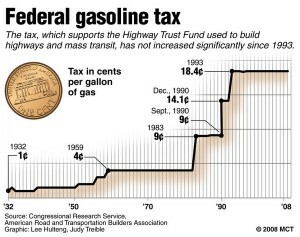 Of course, to start, it would help to raise the federal gas tax considering it hasn't been touched since 1993! For the first quarter of 2009, the mean state gasoline tax is 27.2 cents per US gallon, plus 18.4 cents per US gallon federal tax making the total 45.6 cents per US gallon (12.0 ¢/L). In Ireland, we pay a staggering 75¢/L, over 6 times what Americans pay. Considering the explosion in the price of oil and taking into account annual inflation since 1993, it is scandalous that it hasn't been touched. But I guess, it is a political hot potato that nobody wants to touch as it would spell political suicide. However, this attitude, both among the general population of the United States and the policy makers needs to change radically if the US is to become a role model to the rest of the world in how to herald an oil-thirsty society to a low carbon and secure future.